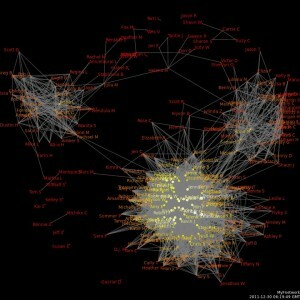 Hiring a network – Jonathan D. Becker, J.D., Ph.D. Yesterday, VCU, the institution for whom I work, announced the hiring of Tressie McMillan Cottom as an Assistant Professor of Sociology. This is a huge win for VCU and for our sociology program. I’ve come to know all of our tenure-track sociology professors and they are an awesome group. They are top-notch scholars who have also demonstrated a deep commitment to creating engaging learning experiences for undergraduate and graduate students. Adding Tressie makes this team extra fierce. Tressie is an amazing scholar; a “public intellectual” in every sense of that term. The announcement by VCU barely begins to capture it, and the “About” page on Tressie’s website doesn’t do her work justice. So, on her own, Tressie adds enormous value to the VCU faculty. But, I argue that we’re not just hiring Tressie on her own. That is, it has been said1 that “these days,” when hiring someone, you’re also hiring her network. That has always been true, to some extent, and perhaps even more so in academia. But, now, in the age of the social web, how we build, engage and use networks has changed dramatically. Veletsianos & Kimmons (2011) coined the term “Networked Participatory Scholarship” to mean “…the emergent practice of scholars’ use of participatory technologies and online social networks to share, reflect upon, critique, improve, validate, and further their scholarship” (p. 768). Tressie is an exemplary networked participatory scholar. Back in 2011, Jo Van Every posed the following question to academicians: “How do you build an academic audience for your (published) work?” She went on to write, “Bloggers actively build an audience for their blogs. Newspapers actively build an audience for their newspaper. Are you actively building an audience for your scholarship?” Per her own website, Tressie’s “…public writing has appeared in Inside Higher Education, The Chronicle of Higher Education, Slate, Dissent Magazine, and The New York Times. Additionally, she has appeared on NPR and Dan Rather Reports.” By writing for publications such as The Chronicle, Slate and The New York Times, Tressie;s work is necessarily accessible by large audiences; they expose her work to mass audiences. But, Tressie doesn’t stop there in building an audience for her work. She is a prolific blogger and a very active participant on Twitter. 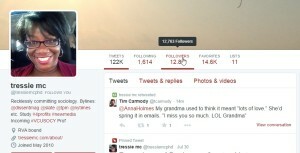 As of the writitng of this post, Tressie has 12,763 followers on Twitter2. That’s a few million short of Lady Gaga and Justin Bieber, but for a sociologist, that’s quite a following. On any given night, you might find Tressie tweeting about House Hunters on HGTV, but, from my perspective, Tressie uses Twitter as a platform to build an audience for her work. 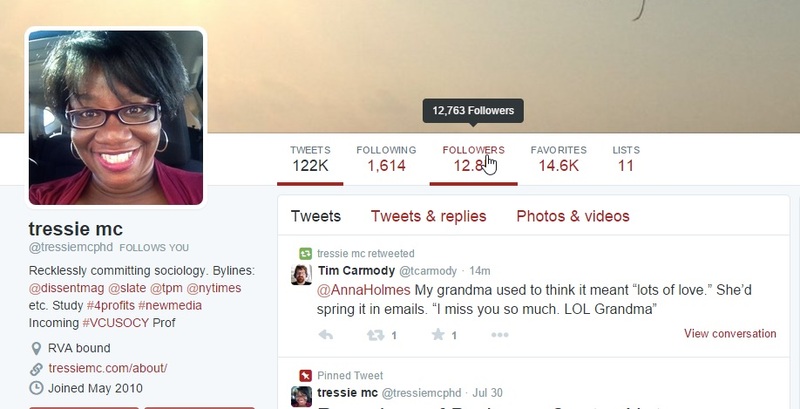 Twitter is a tool in Tressie’s toolbox of networked participatory scholarship. What are the implications of having such a significant following? When Tressie went public with the news of her hiring on Twitter, she was making the news publicly available to her 12K+ followers. Given the ephemeral nature of Twitter, it’s not the case that all of her followers saw the tweet at that moment. But, also as of the writing of this post, Tressie’s tweet announcing her hiring (see below) has been favorited 344 times and retweeted 84 times. That latter number is significant because a retweet is a form of signal amplification. It means that after Tressie told her 12,763 followers, 84 other people passed along the news to their network of followers. There’s certainly overlap in those sets of followers, but network effects mean Tressie’s news about her hiring was pushed out far and wide. This is the power of social media and network effects. Tressie McMillan Cottom, Assistant Professor of Sociology at… #VCUSOCY http://t.co/tAecdLf0kU I couldn’t be happier. Truly. VCU’s Sociology program was already in my short-term hopes/plans. Now that @tressiemcphd is there? Y’all. Y’ALL. Tressie kindly credits me with initiating the process that led to her appointment at VCU. I don’t know if that’s exactly right, but it’s worth noting that I’ve never actually met Tressie in person. I know her only through screens. I know her only because our online networks brought us into contact with each other. So, needless to say, I can’t wait to meet Tressie face-to-face. And, by virtue of network effects, I’m certain I’ll get to “meet” the tremendous network of Tressie’s that we’ve effectively hired as well. “My belief is that when you hire a great journalist, you’re hiring their network, and not just their Twitter network; journalists are networks themselves,” he said.